An increasing body of medical evidence confirms that meditation has a wide range of positive effects for the practitioner. The probably most influential and respected print media in Germany, der Spiegel, recently ran the article: Der heilende Geist: Gesund durch Meditation und Entspannung (The healing spirit: Healthy through meditation and relaxation) on its front page. The four pages long article states that meditation is no longer restricted to being an esoteric exercise for a minority of people. Meditation, helped by new scientific evidence, has moved into the mainstream of medical practice as a tool with proved beneficial effects for the body as well as for the mind. Scientists have discovered several of the mechanisms through which meditation can influence a person´s health and well-being, and der Spiegel describes in particular the stimulation of the nervous system through a pathway called nervus vagus, which is said to be an important link between body and mind.Meditation has been found beneficial for the function of organs such as the heart and the intestines, among others. On the psychological level, meditation has been shown to be useful when it comes to dealing with depression and anxiety, as well as with stress and handling of challenges in general. Brain research is briefly mentioned as well. What is described as particularly appealing is that people through these techniques and practices can empower themselves and take control of their situation, instead of passively being treated. According to Der Spiegel, meditation is no longer necessarily connected to esoteric practices and far-eastern religious thinking. That is indeed so: Myself, I have practiced Acem Meditation for more than 30 years. I have found Acem Meditation particularly appealing because it has a down-to earth, purely psychological approach.Over the last years I have been teaching Acem Meditation in Germany, and the non-religious, non-esoteric ways of Acem Meditation clearly goes very well with Germans. I have myself noted that meditation is well respected and not a controversial thing to do among ordinary Germans. We can look forward to exciting times for the spread of meditation now that it seems to have become part of mainstream thinking in medicine and is described as a respectable phenomenon in the foremost media in Germany. I wouldn´t sign off on all of der Spiegel´s opinions, though. The authors get a bit lost in the woods when they describe “positive thinking”, for example. They may lack deeper understanding of the subject. But I agree when it comes to what sort of technique a person should choose to start with. Der Spiegel notes that you have to find out yourself. As I did myself, when I chose Acem Meditation for its serious approach and Western understanding of meditation as a phenomenon. I haven´t regretted that decision. Meditation truly brings positive energy and it is such beautiful and effortless concept that one can practice in his or her everyday life. One feel so relaxed after meditation. 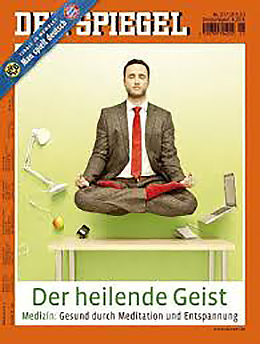 It is great to see an influential journal like der Spiegel publishing on Meditation benefits. I try to meditate daily for 5-10 min. After a lot of personal research, I found a Meditation technique that worked for me and I can notice that I have a much better ability to focus even under stress. I describe it on my Blog in details but it is close from what is usually called mindfulness Meditation. I don’t know much about Acem meditation but it looks like an interesting technique to learn about. Meditation has been around for a long-time, but it’s only in the last decade that it has broken into mainstream. This article makes for interesting reading, there’s no doubt our lives are getting busier everyday and many of us have to juggle multiple things all at once. Finding the time to relax, time to oneself is very important, not only does it help re-charge the batteries but it enables us to develop a clearer focus towards what we wish to achieve whether in business or in our social lives. Meditation forms part of my daily routine and my preferred technique is known as Vijja Dhammakaya Meditation it’s an extremely deep meditation and if done correctly can deliver significant benefits. Benefits such as improved health, lifestyle and wellbeing can be achieved through as little as 30 minutes per day. It is important however, to establish a regular and consistent routine in order to achieve these benefits. I am delighted to hear that meditation has now entered the mainstream and become part of peoples’ lives throughout Germany. You to can learn more about the Vijja Dhammakaya Meditation technique by visiting http://www.vjdms.org where you will find a great many resources to start you on your way. I can’t believe how good I’ve felt with just a little bit of meditation per day which I hope to increase with practice. I use it to quiet the noise around and inside me. Most of which I’ve created for myself. I would never have imagined myself practicing this form of mental exercise, but now I don’t know why I didn’t start it years ago. I have been more focused, more family oriented, and just in the moment. It feels great. Intellectual meditation is a type of meditation where one tries to strive for liberation or mental relief, without any connection to God. So is it a right approach to get real happiness or not , is being discussed here. And do people achieve the desired target through this meditation. I’m actually noticing that a lot of my friends are becoming interested in both meditation and Yoga, so the “mainstream” aspect definitely resonates with me. It seems that many gyms nowadays offer meditation classes and tons of people sign up for them – and not just women, which I find cool. I’m a guy myself and have been doing both meditation and yoga for over 3 years now on a VERY consistent basis; when I started, most of my friends would think it was kind of silly of me to do it (although non of them would say it directly). Now however, it seems that everyone’s enjoying it. All for the better! Ya meditation is refreshment in life. By meditation we completely stress out, I read very much about it in BreakTheNorms & seriously now I am still continue in my life with happiness & full rest. Spiritual Meditation has the power for keeping positive mind and energy. We can get our aim in life by the help of free mind. I am very thankful to Chamunda Swamiji for providing right guidance to get it on right time. I can testimony myslf that among the benefits of meditation are improved health, lifestyle and wellbeing by parcticing as little as 30 minutes per day. It is important however, to establish a regular and consistent routine in order to achieve these benefits. Howdy! Someone in my Facebook group shared this site with us so I came to check it out. Iâ€™m definitely enjoying the information.